This Imperial City Sector set is designed to accommodate Warhammer 40,000 skirmishes set in city ruins planets. 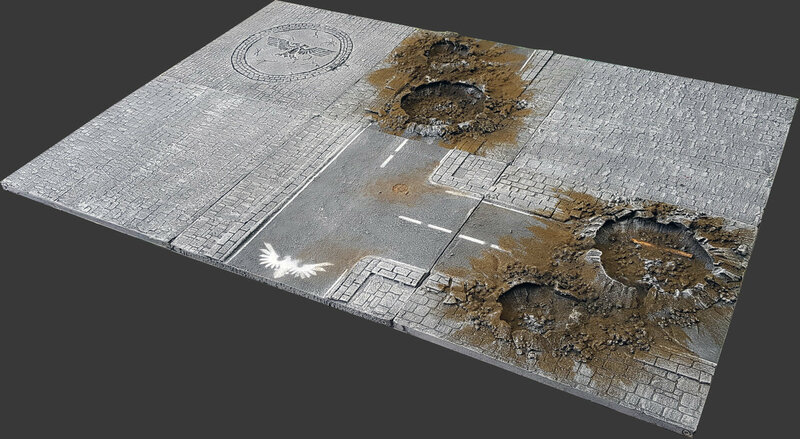 The Set can be augmented with two "destroyed" road tiles from artillery fire, as well as an engraved Double headed eagle motif on an Open Space tile. 3 Asphalt Road Tiles, 2 Straight and 1 "T" intersection. Road width at 14cm, suitable for 28mm scale games. Not in stock - this is the pre-order the Pedion "Imperial City Sector" 2'x3' Urban Battlefield Set. to be hand crafted and painted to fit your order. See estimated delivery time. Each Tile is 30cm x 30cm (1' x 1') and 1cm deep; the majority are made from polystyrene and PVC, with Resin extra pieces. Great for Skirmish, Bolt Action, Warhammer 40K, Kill Team, Necrimunda and Apocalypse wargames, as well as role playing game sessions. Miniatures and buildings shown for Scale purposes only.